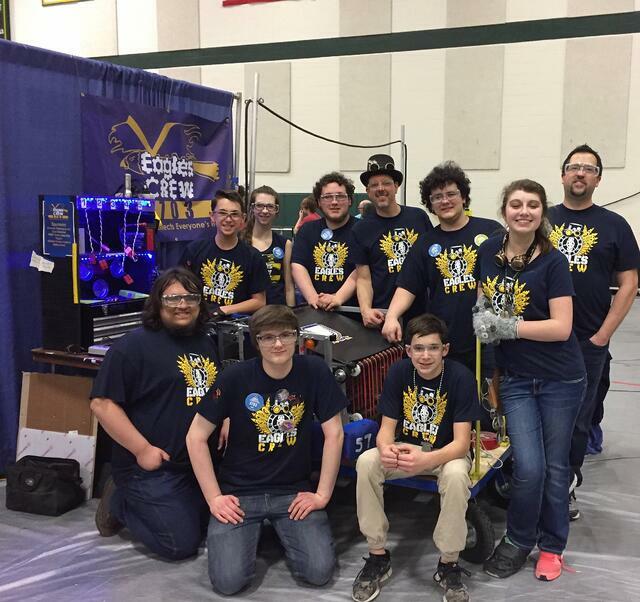 I’ve been trying to find time to write a blog about my experiences with FIRST Robotics Competition since I wrote the first one last year. This is my third year working with a First Team and my first year as the head coach. I’d like to tell that I have everything figured out and that my 25+ years of experience building custom equipment, using LabVIEW and managing engineers has made team 5703 a championship-level team however, I must admit that I learn more every year than the students do. Sure, I have more experience and technical skills than they do but they certainly have me beat in terms of enthusiasm, a “can do” attitude and imagination. After a long build and competition season I’m tired and ready for a break but I can’t help but feel renewed after working with the students. Team 5703 is a small team of 10 students and a handful of parents, mentors and coaches. All of us have busy lives and yet for 16+ weeks we come together, sacrifice all our free time and build a robot to compete with others doing the same thing. During this time, I witness a group of Millennials (or generation Z) working together to reach a common goal. These may be the same students who love social media, will spend hours on the couch with their devices at home, and would much rather text you then have a real conversation -- but during the season they give this up to work hard to achieve a common goal. There are no trophies for participation, there is adversity, no time off is given to recover, and just like real life when we make a mistake we have to fix it and/or suffer the consequences. Many times, the students doing the most are asked to do more and the team counts on the others to “step it up” and complete their tasks too. Somehow, together we all get through it. All of this gives me a tremendous amount of hope that like many other things the news media is only giving us part of the story on what we should expect from Millennials. I have also known this to be true of many of those we hire with engineering degrees. An example of this can be demonstrated with the bumpers. These bumpers are required on the robot to protect it and other robots from damage. Although these are low tech and arguably one of the most simplistic subsystems on the robot they are the bane of many team’s existence almost every year. Knowing this going into the season, planning and preaching these two values didn’t save us from completely rebuilding our bumpers in the 11th hour at our first competition. Our bumpers were the wrong size and too far from the ground which caused us to be the last robot pass inspection and qualify for the event. All of it could have been resolved prior to competition if the student building the bumpers (or a coach) would have used a tape measure and checked the size and location of the bumpers against the rules. Most of it was caused because a random piece of scrap wood was accidentally used to back the bumper instead of the one specifically cut to the right size for the purpose. Failure to spend 10 minutes of time to double check two measurements during build cost us hours at a meet that we could have used for more important things. We have a rule about using the vacuum to collect metal shavings (FOD) and shielding areas when cutting or drilling metal on the robot once we start integrating the electronics on the frame. Obviously, this takes more time especially if you must wait while someone else uses the vacuum. When we mounted the main circuit breaker on the robot, we cut a corner and didn’t use the vacuum. After all it had a solid bottom and couldn’t possibly short to the frame...right? As it turns out, our robot failed to complete a rope climbing task in 3 matches because a microscopic piece of FOD created a path to the frame under the circuit breaker and would not allow the battery to source full current to the motor on the wench. In two out of three of the matches the loss of this 50 points was a difference between victory and failure. Not only was this intermittent problem hard to find, it also caused us an hour of frantic rework prior to the playoffs and cost us several spots in the rankings. Although they can sometimes be overcome by hard work (or rework) the cost for this is almost always too high than you want and the consequences show up at the worst time. During our season, it appears these two items became immutable laws and any time we violated them justice is swift and unforgiving. This is a lesson I learned early in school and my career and I have seen it separate good engineers from the rest and it is something I could have done better as the coach. Other problems that we encountered could be traced back to attention to detail or failure to perform a task correctly the first time. All of this has caused me to think about these issues as I work with those around me and perform my daily tasks. Designing and building a robot isn’t much different than building an automobile, airplane or custom test system. It is the small seemingly insignificant details that separate fair from good or good from exceptional. None of us should be satisfied with good enough and almost all of us can do a better job of not being satisfied with failing to double check the details from time to time. The age-old edict is true “there is never enough time to do a job right the first time but there is always time to fix it later.” This is too costly and all of us can improve. Whether you are an engineer fresh out of university or if you have been around a while I would encourage you to renew your commitment to these two basic principles and to get involved with a local FRC team you will get more out of it than you put in!